I metaphorically stand up here today, shaking in my boots, to share my journey of breastfeeding my son until he was done. The Internet can be both a wonderful and terrible place for breastfeeding moms. We can find bands of women who offer us unconditional acceptance and support; who offer us knowledge and wisdom. Unfortunately, the Internet also offers a swath of venomous, anonymous trolls who are swift in their judgment of our stories. But if we don’t share our stories, our experience will never be normalized. The ignorance that leads some people to believe that full-term breastfeeding is outrageous or damaging will persist. If we hide behind closed doors, always afraid of judgment, never speaking up, nothing will ever change. So here is my story. I breastfed my son until he was 5.5 years old. I have tandem nursed him, along with my daughter, for 2 of those years. She continues. Before he was born I had hoped that I could even breastfeed successfully; I honestly hadn’t known a single person that had. Fortunately for me, we got the hang of it right away. I didn’t know what attachment parenting was. I didn’t know what was natural and good, I just knew what was acceptable to mainstream society. When we reached a year, I heard stories of people stopping cold turkey. I would look into the eyes of my tiny little baby one year old while he nursed happily, while he needed me, and knew that forcing him to stop breastfeeding right now would be extremely traumatic for both of us. Nursing was his nourishment and comfort and sleep-inducing magical potion. I couldn’t do it. I wouldn’t do it. I told my husband we would do it at 18 months; that was still an acceptable time to stop. 18 months rolled around and I had discovered an attachment parenting group. I had researched and learned the benefits of breastfeeding, of healthy attachment, of child-led weaning, of respecting a child as a whole person. We decided then that we would nurse until he was done. Breastfeeding is recommended by the World Health Organization for 2 years and beyond; I know beyond may bring about some side glances and whispering behind hands (or blatant disgust out in the open), but it is the truth. It is natural. It is normal. I believe that people don’t hear about women breastfeeding this long because women purposefully keep that information hidden for fear of judgment, for fear of rejection, for fear of shaming and humiliation. We, as mothers, are doing the very best we can, and to hear people say we are traumatizing our children, or abusing them, or doing it for our own satisfaction, is very disheartening, not necessarily for ourselves, but for humanity. Breastfeeding is natural. Breastfeeding full-term is natural. Anyone who thinks otherwise should really just go open a book (or shut their mouths). We continued nursing all the way past 2, 3, 4. As we approached 5, nursing aversion kicked up a bit. My, at the time, 1.5 year old was nursing constantly. I was drained (quite literally), so I set some gentle limits. We would only nurse in the morning and at night. Slowly that turned into just at night since he would wake up before I did. Then over the next couple of months it became sporadic at night. Then it stopped. We didn’t nurse for weeks. I was ok with it. Life was demanding and it was one less demand on me. I found other ways to connect with him and cuddle him. At 5.5, on the night before my daughter’s second birthday, (he hadn’t nursed in a month), he was having a really hard time. We had a lot of projects to complete, bags to pack for a camping trip, etc, and he was overwhelmed in the chaos. I was alone with him, rocking him, just as I did at 1,2,3,4, and he asked if he could nurse. I hesitated for a moment, we had gone so long, but I could see the little baby in his eyes. This little five year old was much closer to an infant than a teenager and he sought his original comfort of the last 5 years. I said yes. I nursed him for a few seconds and could tell that he was having trouble getting any milk. He tried for a minute, and wasn’t very successful. He looked up at me and said “I can’t get the milk out. Thank you for your nursies. I love you mama.” It hit me right then that this was the last moment he would ever breastfeed again in his entire life. Our nursing relationship had come to a close. As I looked at him, I could barely remember what he was like as a little baby; as a 2 year old; or even a 3 year old. I could remember specific memories, but all that had passed was as if it was a different person in a different life. He was 5.5 now. He looked like a big kid. He was intelligent, curious, fast, and artistic. He was growing up and there was no way to stop it. I sat and hoped that these past 5.5 years were special to him; they were all he had experienced so far. I hoped that they were special even though neither of us remembered every detail. I worry that in five years I won’t remember what he was like at five. That I won’t remember that last nursing session or the thousands that preceded it. I want time to stand still at times so that I can remember every detail of every moment, but we all know that isn’t possible. The best that I can do is be more present, be more mindful of our time together, choose connecting over busyness, choose to play instead of work, choose to stop what I’m doing when he says that he wants to sit on my lap. I try to remember that growing up isn’t a tragedy; it is the point, but knowing that fact doesn’t make these endings and new beginnings any less painful, any less bittersweet. I love him. I love that I found a support group and followed my heart and let him lead. As vulnerable as I feel right now, I offer you my story because I want you to find support and courage too. I want you to know you are not alone, not an outcast, not on the fringes. I am just one of many mamas who follow the lead of our children in breastfeeding, in growing up. I add my voice in the hopes it helps you on the same journey. Our stories connect us, the more we share them the more understanding we will find in the world and the stronger we are. I breastfed my son until he was 5.5 years old and it was beautiful. It was natural. It was authentic. It was normal. You are amazing mama I too am doing the same and I have grown so much as a women and a mama that the voices I used to listed to around me that made me judge my instincts are just chatter now. By sharing your story you will help other women's critical voices become just chatter as well. Thank you for this, today..... I've been sitting here with my little guy who will turn 3 next week, wishing he wouldn't keep asking for "snacks" every 10 minutes so I can cook dinner and get a shower.... wishing he would quit asking for "snacks" for good so I can start taking some weight loss drugs and get my body back to normal.... and I know I will miss it when the day comes, no matter how short on patience I am today. He's my baby, my last of 4, and this is our time. Thanks for the reminder. Thank you for sharing this. I am still nursing my 2 year old and my husband was unsure at first... but then I explained some of the who recommendations and he hasn't really said much about it. We do pretty much only nurse at home these days and mostly at night or to comfort. I do feel bad for telling my older daughter she couldn't nurse again. She had stopped on her own around 8 months. Here she was at 5 and wanting, playfully asking to nurse again. I could tell she just wanted some comfort and I offered cuddles. I have no idea how long our younger daughter will nurse for but I will miss it for sure. I remember being up late.. with my first wondering how long I could take it. Our nursing was difficult but we tried as long as well could. I often feel bad enjoying the extended nursing I get from my second that comes so easily. Wow, what a beautiful story. Thank you so much for sharing. Thank you so much for sharing! 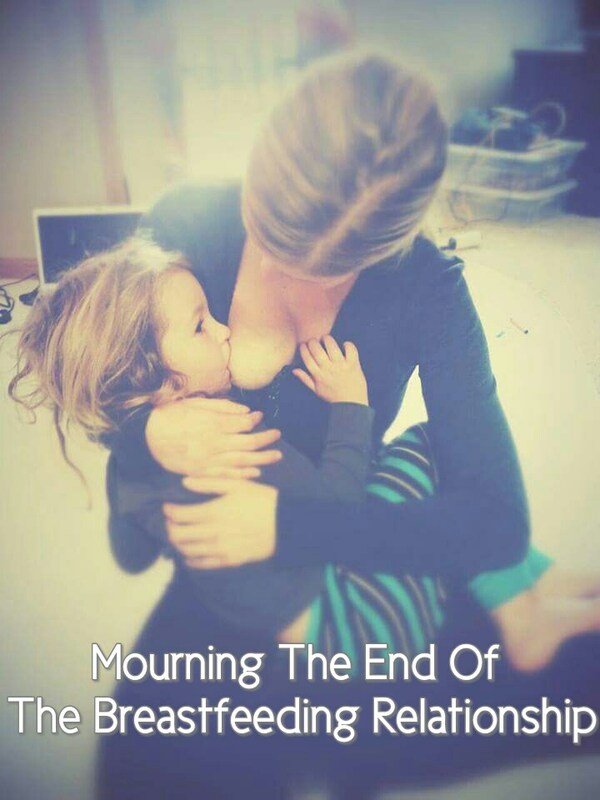 I'm "still" breastfeeding my 2.5 year old and I just don't see/ hear people talking about it positively enough. Nursed my first for three years and 7 months overlapping with my one-year-old who is still an avid nurser. Thanks for sharing your story. My daughter just turned 2 a few days ago and I love our nursing time. I just found out a little while ago that I'm 8 weeks pregnant and I know that I will probably dry up soon. I don't know what to do. I'm having a really hard time coming to grips with it and I know that she'll freak out. Your article made me feel better but also sad because I wish I could go longer. Thank you. Today is the 6th morning that my 36 month year has not asked and I have not offered. Feeling sad, relieved, guilty and grateful all at once.